It's been a day of insane wind. I'm an early riser, and when I got up at 4:30 am, it was calm. But at 5:27 am -- I looked at the clock -- I heard the wind crash into the house. We knew this wind was coming yesterday, so we tried to get all water-related things done (when we lose power, we lose water since our well pump is electric). 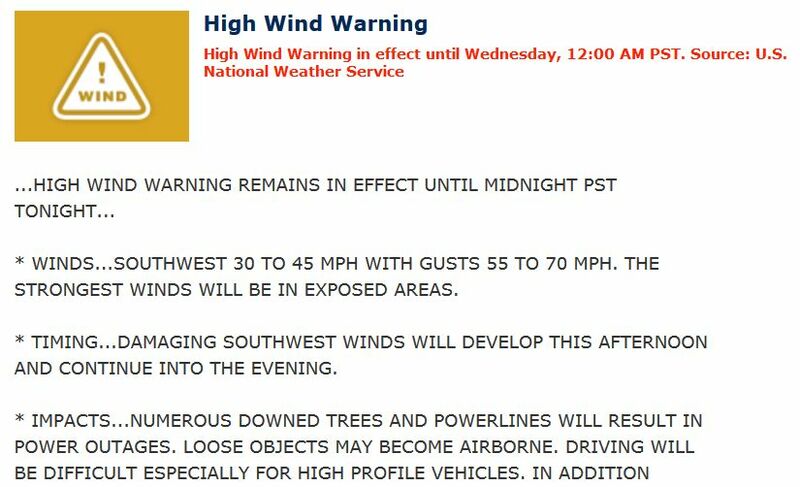 All day long the wind gained in strength until it was positively shrieking and shaking the house. Early this morning I caught up on all the laundry. After daylight, I made sure to clean and stock Polly's and Matilda's pens with food and water. Moving hay across the yard during wind would have virtually impossible later in the day. Don made sure a few days' worth of split firewood was stacked on the porch. We went out several times throughout the day to make sure the stock tanks stayed brim-full. You can see the wind blowing the water sideways as I filled this tub. The chickens prudently stayed in whatever shelter they could find. The wind was so strong it literally tipped a couple of chickens over and sent them rolling while outside. In the process of installing a window at the far end of the new barn annex, Don temporarily put up some OSB to keep the wind from shrieking through the barn (this end of the annex faces into the prevailing wind). Let me tell you, this made things much snugger in the barn. Concerned that the high profile of the bee hive might cause the wind to tip it over, Don and I strapped it down. If it looks like the end of the strap is blurry, that's because it was whipping in the wind. I filled up two pitchers of water for immediate kitchen use in case we lost power. We have about fifty gallons of stored water in the house, but it's always nice to have fresh. ...and sheared the door handle off the barn door. Late in the afternoon, just near dusk, a smaller dead tree went crashing over the compost pile. Fortunately no chickens were caught underneath (they were all cowering in their coop by this point), but it did freak out a couple of cows who were nearby. The lights have been flickering all day but amazingly the power has stayed on. We have an oil lamp lit just in case (and others on standby), but so far so good. 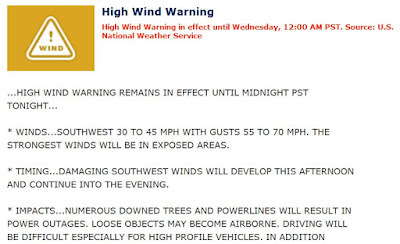 The wind is supposed to die down around midnight, and tomorrow is forecast to be calm. Such are the vagaries of weather -- all we can do is roll with the punches. UPDATE: The power went out at 6 pm. The Spokane news is telling people to "shelter in place." What a storm! I'm going to shut my laptop down to save battery power. Good thing we spent the day prepping for this! The awesome power of the weather can be quite interesting and formidable. Stay safe and warm. We feel your pain here in central Colorado.... today was blustery here (in the valley) at 8000 ft, 30-40 mph winds. I drive an 8000lb vehicle, and was getting pushed sideways by the wind on my way home today!! Stay inside if you can!! :) Your account of the chickens being blown sideways sure paints an impressive picture. Having lived in south eastern Wyoming, I can understand what you go thru. Hang on !!!! Good job on staying on top of the elements. So often people who don't prepare think it's something hard and takes great effort, but really it's just doing what you usually do, just a little bit extra. I am also a country girl, and we also had to be preppers. Grocery shopping was once a week, so you got everything you needed at once. When weather was bad in the winter we couldn't always get out, but Mom had canned and frozen food from the summer garden and the hogs we slaughtered ourselves, so maybe we couldn't eat what we wanted, but we always had something to eat. This example has carried throughout my life, even though I live in an apartment in town now I still keep a week's worth of groceries on hand, candles and extra blankets for power outages, etc. Being prepared isn't hard, it just means paying attention and looking ahead. Thanks so much for your efforts in showing us your lifestyle. Living in hurricane central, I have seen winds like yours that would still manage to flip over your bee hive. Might I suggest that you attach your anchor straps to auger type ground anchors. Praying that your storm is over soon with no serious damage. Our water, too, depends on having electricity. I learned years ago to fill our bathtub with water, so we can flush toilets. We're a long way from you, but two days ago our winds were between 50 & 70 mph, and lots of dead branches ended up scattered across the front yard. Glad your buildings held up, and you and your critters made it through. We are in your region so we also enjoyed the storm last night . It was a good thought process for preparation situations . We enjoyed a nice warm fire in the stove and a glass of wine in the glow of gently burning candles . Our well also stops when there is no power so we fill a few pitchers and pots and we also have several gallons in storage . The event gave us opportunity to discuss our preps for these situations , always a beneficial time for us . We had pretty much the same day you did yesterday. I darn near blew the (BIG) gas grill off the deck. Even the ravens stayed home. We lost power just before 5pm and didn't get it back until this morning. And Yosemite's got nothing on us....we now have a "drive-through" tree, too, after a huge tree fell across one of the main roads. Somebody took their chainsaw and cut a one lane pass through in it. By today it'll have been cut up and carried off for fire wood. I really have to hand it to the folks at the local PUD. They do a great job. They had a long, cold, wet night last night. I'd just started supper when the power went off, so I cooked on the wood stove. We had a great supper and no later than usual. Afterward we played a board game and read by oil lamp and candle light until bedtime. It was a very pleasant evening. We keep 5 gallons of water each in the bathrooms and have plenty stored for drinking and cleaning and bathing, so we manage OK. I'm sure glad nobody was hurt in that blowdown over your compost pile. That's the scariest part of a wind storm here in the woods. You just never know what's gonna fall or where it'll go or when. Best advice I know for times like these is "Stay Ready". Thankfully we are not getting that kind of weather here yet, but it will be coming. I'm glad there wasn't much damage. I am curious how you would provide water if the the power were out for an extended period of time, Also, I just wanted to say how much I appreciate your blog. I am learning so much! I was on my way to pick up my husband from work during the worst of the storm last night. I saw four blue-green flashes of "power arcs" from transformers and after each flash another section of the town went dark. My husband lost power at work. He was also watching the Avista website. At some point, up to 100,000 customers were out of power last night. My in-laws are still without power and their house is 58 degrees and dropping. They will probably be coming over here soon. We had some flickers, but the power stayed on. I think that the Post Falls prairie is devoid of tall trees, so we didn't have as much trouble with falling branches over power lines. I was super worried about my goats. My husband wouldn't let me go check on them until the wind had died down. I feared that the metal truck canopy I used to construct their goat house out of might have overturned and they were loose! 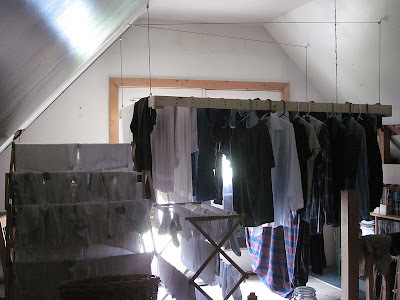 But my fears were for naught, I just had to tie the hay tarp back down. The little goats were actually out in the wind eating all the dried leaves caught in the fence! Isn't it wonderful, the feeling of security that being prepared gives you? We actually saw coverage of this on the national news this morning. 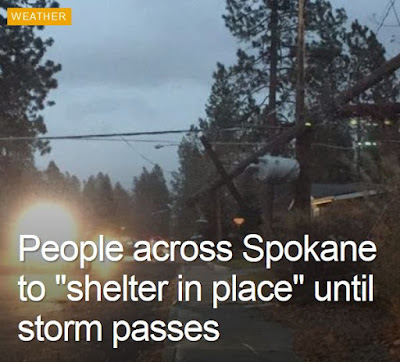 They said three people in Spokane died from falling trees! So sad. Hope your weather calms down and things can get back to normal soon. Between that and all the smoke from the wildfires, you all have had a tough go of it over the last few months. Excellent job of being ready. I have to admit, shamefacedly, that I've been remiss this year (just in getting ready for winter in general-- I need to be more motivated, more assertive about doing what I want done, and less prone to give in to anxiety). You did inspire me to get my fanny outside and put away, tie down, and batten hatches. Stay safe. Let us know how you fare. It was certainly a day to be home; we weren't. Traffic lights were out in CDA, a semi was blown over outside Worley, power lines down between Plummer and Saint Maries caused us to backtrack to CDA and go over 4th of July pass then south, trees were down in the road, but we made it home. We saw lightning behind the clouds, something I can't remember seeing. Yesterday's sunshine helped spirits as we did property clean up; still a couple trees that have fallen into other trees that need to be cut. Praying for the families that lost loved ones and for the driver of the semi. There are many wonderful hand well pumps that fit nicely in the same well casing as your electric pump. The companies are very helpful with DIY installers. For a temporary setup you can also run a designated water hose from the hand pump to a house connection (spigot) or to your well tank, which, depending on your setup, might be able to feed directly into your house. Alternatively, you can buy and bury some PVC below the frost line if you want a more permanent solution. All you have to do is bring it up right next to a house spigot and then you can jump the connection with a washing machine hose (insulated during winter, of course) when needed. About that beehive - good to strap it down. i've had covers ripped off by the wind in the past. Now I put cement blocks or big rocks on top. Also, that looks like a mighty tall hive, which is a lot of room for the bees to have to keep warm in the winter. Here in MI, where it gets down to -20F, we winterized the hives by wrapping them in insulation (the pink or green foam stuff. It has a name but I forget what it is). It really improves winter survival rates - I don't get hives that freeze to death anymore. I just cut four pieces of the insulation the same size as the four sides, minus an inch or two on the side with the opening for the bees to get in and out, and I wrap them onto the hive with some duck tape. You might want to consider that. It's really annoying when a hive freezes to death with half its honey left above it. Stay warm and safe!